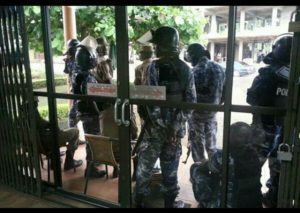 Policemen who have been deployed at the Red Pepper offices in Namanve were withdrawn this evening. Staff of Red Pepper Publications Ltd, a local tabloid, can now formally do their work without disturbance after police withdrew from the company premises, ending 84 days of siege. The news of the police withdrawal on Wednesday was confirmed by the paper’s Editorial Director, Arinaitwe Rugyendo. Mr Rugyendo said the withdrawal will allow them to continue doing their work professionally. Despite President Museveni ordering the police off the media company’s premises last month, the men in uniform had remained camped there. Nevertheless, the newspaper had resumed publications but were outsourcing the printing services of government owned Vision Group. The Red Pepper was closed down on November last year after it published a story alleging that President Museveni was training Rwanda rebels to topple the government of President Kagame. The newspapers 5 directors including Richard Tusiime, Arinaitwe Rugyendo, James Mujuni, Johnson Musinguzi and Patrick Mugumya and three of its top editors were jailed for a month and charged with three counts including publishing information prejudicial to national security. They were granted bail on December 19, 2017. After meeting the tabloid newspaper’s directors at State House, Entebbe, last moth President Museveni reportedly warned them against reckless reporting in future. The Directors and Senior Editors pledged to the President and the nation, a more transformed and professional publication going forward.